Posted on Wednesday, July 10th, 2013 at 7:32 am. Boxing History: July 9, 1926 Pete Latzo WF 4 George Levine, NYC. Retains world welterweight title. Pete Latzo (August 1, 1902 – July 7, 1968) was the boxing world welterweight champion from 1926 to 1927. Latzo fought all the top welterweights of his era and won the title from hall of famer Mickey Walker on May 20, 1926. He lost the crown to Joe Dundee on June 3, 1927. After losing the welter crown Latzo invaded the heavier ranks. For the duration of his career he fought middleweights, challenged for the world light heavyweight title and even fought heavyweights. Latzo fought many great fighters in his career, including future heavyweight champion Jim Braddock, Light heavyweight king Tommy Loughran, and middleweight champion Tiger Flowers. Latzo was the inspiration for the comic “Joe Palooka”. Cartoonist Ham Fisher met Latzo outside a pool hall and, impressed by his personality, sportsmanship, and physique, was inspired to create his popular character “Joe Palooka”. Latzo resided in Marven Gardens in Margate, NJ.He was a popular figure at many of the affairs of the Veteran Boxer Association ring #9 and other rings around the state of New Jersey, where he made his home after his retirement from boxing in 1934. He died in Atlantic City in July 1968 at the age of 66. 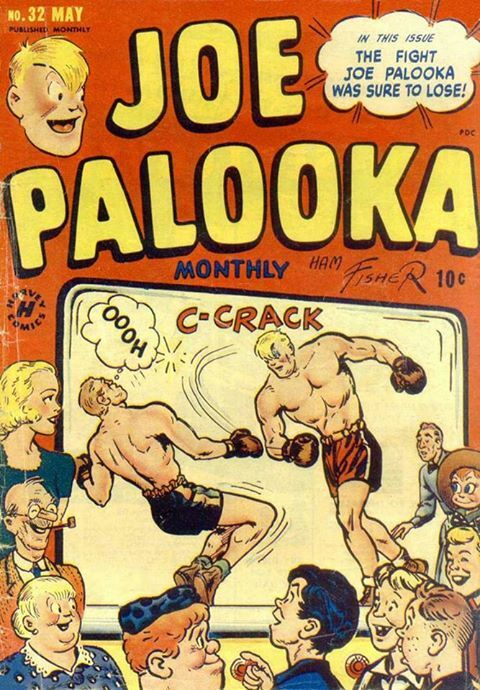 Joe Palooka was an American comic strip about a heavyweight ?#?boxing? champion, created by cartoonist Ham Fisher in 1921. 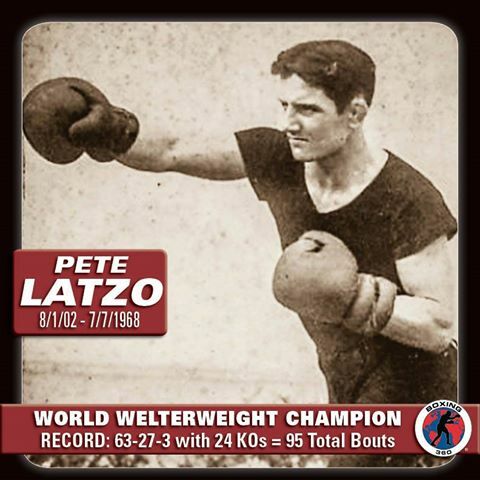 The Joe Palooka character was based on World Welterweight Champion, Pete Latzo. The strip debuted in 1930 and was carried at its peak by 900 newspapers. The strip was adapted to a short-lived 15-minute CBS radio series, 12 feature-length films (chiefly from Monogram Pictures), nine Vitaphone film shorts, a 1954 syndicated television series (The Joe Palooka Story), comic books and merchandise, including a 1940s board game, a 1947 New Haven Clock & Watch Company wristwatch, a 1948 metal lunchbox featuring depictions of Joe, Humphrey and Little Max, and a 1946 Wheaties cereal box cut-out mask. In 1980, a mountain in Pennsylvania was named for the character.